The classic boutonniere, a longstanding staple of the debonnaire gentleman's attire, has a six-century history as an elegant accessory for the groom's wedding suit. Although the design of each groom's boutonniere is just as unique as the wedding itself, there are only a handful of timeless flowers that most men opt to wear. Historical favorites include Cymbidium Orchids for good luck, Lily of the Valley for trustworthiness, hyacinths for constancy of love, gardenias for pure joy and Sweet Williams for gallantry. Tight blooms and miniaturized versions are typically used to create lighter, longer-lasting boutonnieres that can stand up to a full day of wedding demands. Here are five of the most traditionally used flowers in boutonnieres. The universal symbol for love, the rose is the most requested boutonniere flower. It is often embellished with a sprig of green ivy and baby's breath. Traditional couples having a formal wedding tend to choose white for eternal love or red to represent passion, or they combine both to signify unity. Yellow roses are also commonly used to express the promise of a new beginning. A single rose of any color communicates gratitude in the language of flowers, making it the perfect design for all the other men in the wedding party. Considered less formal than the rose by Americans, the carnation is the preferred choice for the groom's boutonniere across the world. The national flower of Spain, and offered as a sign of respect in Korea, the carnation is also favored by British royalty for formal events. Inexpensive and hardy, the ruffled petals of this small flower work well for a wedding. Carnations are available in a wide selection of shades to match the wedding colors, although white and red are the most common. Southern U.S. African-American men often wear white carnations in remembrance of their mother if she has passed away. Since the Victorian era, green carnations have been adopted by the GLBT community as a symbol of love and pride. The carnation is traditionally worn without greenery or embellishments. The clean lines of the elegant calla lily are attractive to contemporary grooms who want to make a sophisticated yet fashionable statement. 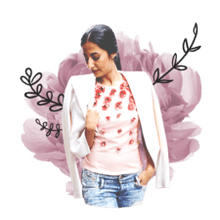 Symbolizing purity of heart, the mini calla comes in dozens of shades as well as dual-tones, such as purple-tipped yellow flowers and red-tipped orange flowers. The quintessential spring flower, tulips represent perfect love. As the national flower of Turkey, they symbolize affection and happiness. With more than 100 species, tulips are inexpensive and available in nearly every color choice, including dual-tones, when in season. Nearly any variegated greenery can be used as a backdrop to make the flower stand out, but ivy, ferns, herbs, leaves and baby's breath are among the most common filler flowers. Rosemary, thyme and mint are often tucked in to bless the marriage with good luck and health. Embellishments range from berries and ribbons to seed pods and twigs. 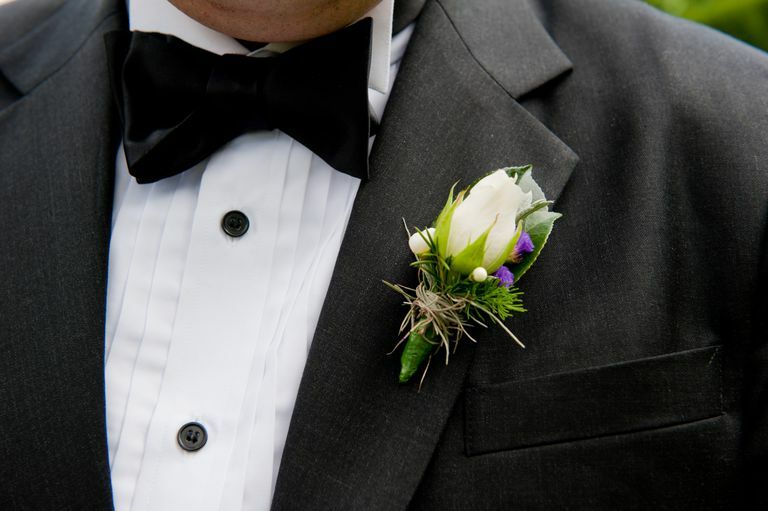 To honor the chivalric origins of the boutonniere, the groom's flowers should coordinate with the bridal bouquet. Exact matches were trendy until the 1990s, but most modern grooms opt for an arrangement that compliments the bride's style or color of flowers. In Australia, the groom's bloom is literally plucked from the bouquet before he walks down the aisle. A small decorative vase, which was a popular status symbol during the Victorian and Edwardian eras, is an elegant alternative to a straight pin when a loop is not possible. Equipped with either a bar pin or magnets, the vase can be attached to the front or back of the lapel.